Police and volunteers take down PLO flags hung on Highway 1 apparently in response to court decision on illegal Bedouin village. 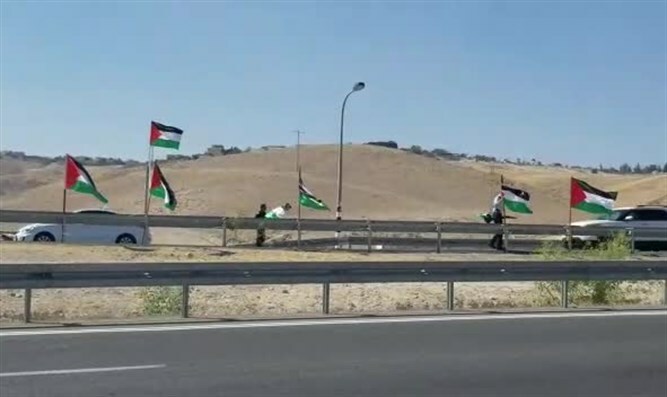 Hundreds of PLO flags were hung at noon on the road between Jerusalem and the Dead Sea Wednesday afternoon, apparently in response to the Supreme Court decision delaying but not cancelling the evacuation of the illegal village of Khan el Ahmar in the area of ​​Mishor Adumim. Volunteers and police summoned to the scene collected the flags, in light of the fact that placing PLO flags in Israeli territory is considered a crime. Amit Ararat, a spokesman for the town of Mitzpeh Yericho, told Arutz Sheva: "I saw two Palestinian flags on Route 1. I felt humiliated. In my heart I cried: 'Where is the government?' I got caught up and reported directly to the Ma'aleh Adumim police station and they arrived and made sure to take down the flags. " Ami Shapira, a resident of Nofei Prat, who was crippled and in a wheelchair, came to the area to take down the PLO flags and stand with an Israeli flag to protest the incident. Yigal Dimoni, deputy director general of the Yesha Council, joined him and said: "We came here to protest the flags that were hung along Highway 1, and the flags that remain are proof that this is their desire: to take over a central road in the State of Israel. That must not happen."